As I’ve grown (and hopefully matured) I’ve noticed that there have been times when people have entered my life at exactly the perfect time to bless me in some way. Usually, before I even knew I needed them. One example was my freshman year of high school. Just a month before the start of the new school year a family moved to our area. The oldest girl became my best friend and for four years we were inseparable. Our interests, goals, and other friends were so alike that she helped make my high school years better than they could have been. We pushed each other to work harder, do better, and of course have lots of fun! Or how about two different women who have let my children claim them as their surrogate grandmas? These wonderful ladies have taken my family under their wing as one of their own. As I’ve mentioned in other posts, we don’t live close to any of our family, so to have these special mothers take it upon themselves to mother me and grandmother my little ones is so meaningful to me. There’s also the neighbor who happened to move in right around the time my husband and I were finishing up our training to become foster parents. And what do you know? They were foster parents as well! They have become some of our closest friends as we’ve gone through the trenches together. We’ve leaned on each other for emotional support, we’ve asked questions on how things work, we’ve watched each other’s foster children, and we’ve made sure to help each other remember to take time for ourselves as we serve these little ones. And of course, I can’t forget to mention Steph. You’ve come to know her here on MomDot, but I’ve had the pleasure of calling her my bestie for 10 1/2 years now! There’s no blog post long enough to explain how she has blessed and enriched my life. We’ve laughed together, we’ve cried together. Whether we’ve lived right around the corner from each other or hundreds of miles away, we’re as close as sisters and I can’t imagine how different my life might be right now if she hadn’t “popped” into it. So with all of that in my mind, I want to show you our third printable valentine for this week. It’s all about the appreciation we have for those who have shown up in our lives (or our children’s lives) who have made it better in small or big ways. 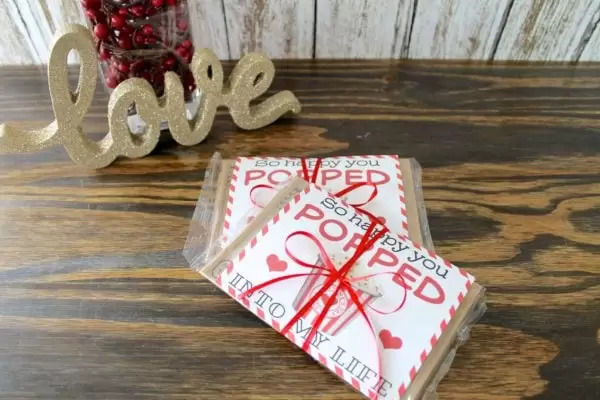 It’s simple to print out, easy to attach to the gift, and you can also add your own handwritten message to let your loved ones know how thankful you are for them. 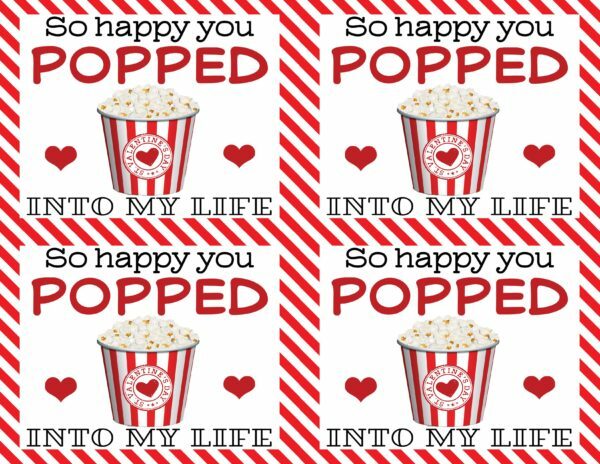 First, as with all the other printables, print off the So Happy You Popped Into My Life printable valentine that you can find in PDF form right here. Helpful hint: Everyone has different printers, settings, preferences, etc. but I’ve tried to make my printables work for what the majority of people are using as their settings at home. Which means you shouldn’t need to do anything special when you print. Just open the PDF and click print. If you find edges and words are getting cut off, double check that your settings are no bigger than 100%. You might also want to try clicking the “fit to page” option. Please note this printable needs to be in landscape mode, not portrait. You may or may not need to change that portion in your settings. Second, cut and trim into four cards. You can use a paper cutter or try out decorative scissors to give it a special edge. Third, grab your other items. Which is basically unpopped popcorn bags, tape, and ribbon! Fourth, use a small piece of tape to attach the printable to the unpopped popcorn bag. Then wrap the ribbon twice around the bag and tie in a bow. And you’re all done! That was easy, wasn’t it? 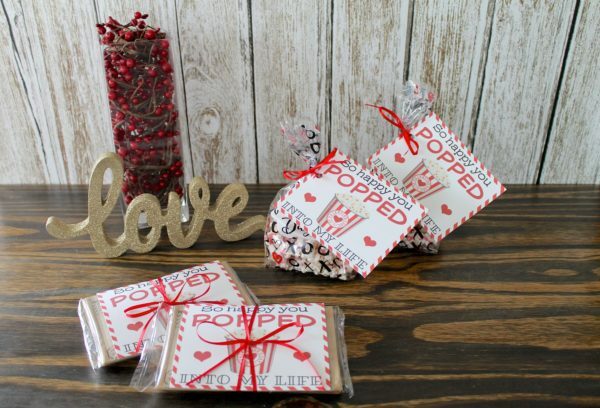 Be on the lookout for our next post, which will give you an AMAZING recipe for white chocolate covered popcorn with M&M’s that you could also use with this printable valentine. It’s the perfect combination of sweet and salty. You’ll love it! And I really want to know who are those people that you are glad popped into your life? Who are the ones who have really made an impression, whether they’ve been around forever or were only with you for a moment? Let me know in the comments below! Love your website so far I am mom of three children ages 12,8,5 and your website really inspired me to be more creative then just buying a simple present. It makes you feel different to be able to create projects from simple ideas and once you have accomplished them you feel good inside and want to show it off to all your friends. Thanks for your wonderful website for moms to learn and be creative themselves and to get the kids more involved and interested in these crafts that helps their minds be more creative. You Rock!! Thank you so much for the compliment. We definitely hope to inspire moms to be creative, try new things, and have fun making memories with their kids. We’re glad you’re loving our site!